We are a leading Manufacturer & supplier of Stainless Steel Plug from India. Our range of Stainless Steel Plug is available in various sizes, shapes and mainly used to close the end of the pipes. 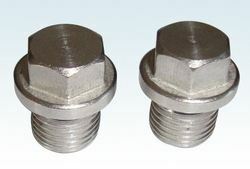 Developed using stainless steel the plug is similar to cap but fitted inside the fittings. We Piyush Steel offer customization on our range as per the requirement of clients. Moreover, these beds can be moved and fitted easily, which provide maximum satisfaction to our patrons.